I do love a good breakfast shake in the morning! It's the ultimate grab and go breakfast. You can drink it on the way to work, school or any morning appointment you have. This shake is especially nice because it has coffee in it! Any time I can get my caffeine and breakfast in one convenient cup is a win. 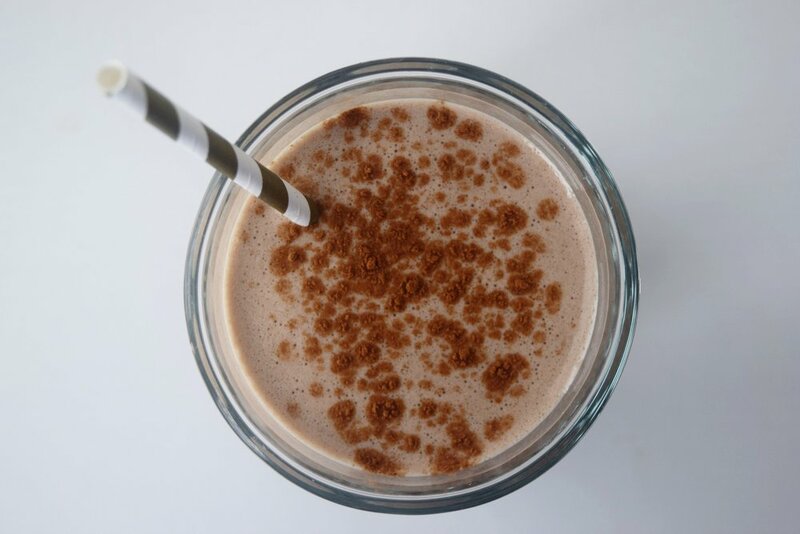 This shake tastes like a mocha latte but without the loads of calories. It has cashew butter and rolled oats to keep you full until lunch. A healthy dose of coffee is added in for energy and frozen bananas with a touch of honey to satisfy your sweet tooth! Try this shake for breakfast tomorrow and get your morning off to a sweet and energizing start!! Place cashew milk, coffee, honey and cashew butter in blender. Blend for a few seconds until smooth. Add in remaining ingredients and blend until smooth. Adjust sweetness by adding more honey if needed. I have an everlasting love affair with peanut butter. I could eat it on and in everything! I love it so much I eat it by the spoonful out of the jar at pretty much any time of the day…it’s a problem friends! So any chance I get to incorporate peanut butter into anything I make is a good day! These chocolate peanut butter protein muffins are both delicious and handy. Rich chocolate, salty peanut butter and a dense cake-y texture make these muffins something special! The best part is that these muffins are only roughly 145 calories each! I started experimenting with a protein muffin after I found I was blowing my diet on a so called “healthy” frozen muffin that was actually sugar and fat laden. I started by making a banana based muffin, but found that while they were tasty right out of the oven, the muffins molded quickly and had a weird moisture issue the longer they sat (anybody else have this problem too?). So I started working with a base of whole wheat flour, protein powder and Greek yogurt. The muffins tasted good, but were still slightly dry. Then the other day I fell into something unexpected. I had a leftover half can of pumpkin puree in the fridge, so I added that into my muffin base as a random experiment and BAM! It added the moisture that this muffin was missing yet you can’t taste the pumpkin. Enjoy these muffins as an after workout protein/carb refuel or as a fast morning breakfast! They also freeze well for up to 3 months. Simply thaw in the fridge overnight or place a frozen muffin in a microwave and blast it for about 45 seconds. Preheat oven to 375 degrees. Grease a 12-count muffin pan with nonstick spray or oil. In a large bowl, combine pumpkin, sugar, maple syrup, eggs, Greek yogurt, oil, ½ cup peanut butter and vanilla extract. Whisk until smooth. In another bowl mix together flours, cocoa powder, salt, baking soda, baking powder, protein powder and cinnamon together into a large bowl. Slowly stir in the wet ingredients. Don’t over mix or you will have a chewy muffin! Fold in the mini chocolate chips. Fill muffin pan with batter, fill muffin cups up to the top. Using the melted 2 tablespoons of peanut butter, spoon a little on top of each muffin. Using a toothpick, swirl the peanut butter into the top of the muffin. Bake for 18 minutes until a toothpick inserted in the center comes out clean. Allow to cool 5 minutes, then remove and cool completely on a wire rack. Muffins stay fresh in an airtight container at room temperature for up to 4 days. Summer is when I eat the most salads. Fresh produce and long summer nights just scream for a balanced and delicious salad! They keep my kitchen cool and don’t weigh me down so I have plenty of room for my favorite summer dessert, strawberry shortcake (it’s all about priorities right?)!!! Top off this light and savory salad with a tangy thyme vinaigrette and you have the perfect dinner or lunch! Mix vinegar, shallot, mustard, dill and thyme in a bowl. Whisk in olive oil slowly. Season with salt and pepper and set aside. place the eggs in a saucepan and cover with cold water by about 1 inch. Bring to a simmer over medium-high heat, then cover, remove from the heat and let stand, 10 to 12 minutes. Drain, then run under cold water to cool. Peel under cold running water. Chop and set aside. Remove husks on corn and wash under cool water. Roast corn on the grill until golden and grill marks appear on the corn. Remove from grill and let cool. Using a sharp knife carefully cut corn away from cob and set aside. Assemble salad by placing torn romaine and basil in a large bowl and adding corn, tomatoes, avocado, turkey, chopped egg and blue cheese in rows on top of salad. Drizzle with dressing and serve. I love peanut butter with a passion. As a kid I would eat giant spoonfuls of the homemade peanut butter my mom would make...pure heaven! As an adult, I can’t really get away with that now, so I resort to peanut butter flavored baked goods to quench my peanut butter cravings. That’s why I feel these power bars are one of the best things to come out of my kitchen recently. Once I pull the pan out of the oven, I have a hard time not eating every last crumb immediately. Soft, dense and incredibly satisfying, these bars taste like a peanut butter dessert! Plus it’s got a nice wallop of protein from the peanut butter and protein powder! Delicious and it will keep me full? Yes please!! I love to eat these bars as a super fast breakfast or as an afternoon snack when my peanut butter craving hits! Preheat oven to 350 degrees. Grease an 8x8 pan with butter or olive oil. Mix all ingredients together in a large bowl and thoroughly combine. Spread evenly in prepared pan and bake for 20-­25 minutes, or until edges are golden brown. Eat warm, or cool to room temperature and cut into bars. I suggest storing these in an airtight container in the fridge!